The Army has filed charges for a special court-martial against Spc. Alexis Hutchinson, a single mother of a one-year-old baby. Hutchinson missed her deployment to Afghanistan late last year when her child-care plans for her son, Kamani, fell through at the last minute. Hutchinson and her attorneys had been working with the Army in good faith to resolve her situation administratively, rather than through the criminal process, and still hoped that would have been the most fair and compassionate way for the Army to deal with the difficult situation. Maj. Daniel Gallagher is the rear detachment commander of the 3rd Infantry Division, and is, according to Hutchinson’s civilian attorney Rai Sue Sussman, "the one who signed the charges [against Hutchinson]." "I am disappointed in Major Daniel Gallagher’s decision to go ahead with filing charges, which shows a lack of compassion for this young mother and her infant son, and a lack of discretion in dealing with the situation fairly," Sussman wrote in a press release issued on Thursday. "The situation tends to show that the Army is not able to effectively and humanely counsel Army families in this situation. An infant and his mother were forcibly separated, when other options were available to the commander. This was a failure of her chain of command to properly counsel her, given her situation. On top of all this, criminal charges seem unnecessary." Sussman explained that the Army claims to have offered to counsel Hutchinson with other options, but said she "can’t imagine that they gave an offer beyond foster care – but they were unspecific in their press release [released Thursday] about what that child care would be." The military’s press release on the matter stated that Hutchinson’s command had informed her of other options to take care of her child, but that she had refused these options. Sussman said she speaks with Hutchinson regularly, and knows that government care for her infant is not something her client wants to do. In previous instances when soldiers deploy and leave a child in state custody, when the parent returns they often experience problems in exercising their parental rights, and in some cases have even lost custody of their child. Sussman explained to Truthout that she was taken aback by the Army’s recent decision, particularly when she felt that negotiations were making progress. "First we offered and put in an application for a Chapter 5A discharge for parenthood, which is an honorable discharge," she said, "But more recently we were willing to take a misconduct discharge to get things over with. But her commander rejected that and filed criminal charges. Hutchinson would really just like to put this all behind her." Sussman feels that "in terms of equity and efficiency, and even punishment, I think the Army could do this a different way than a special court martial." If Hutchinson is found guilty during a special court-martial, she could face up to a one year detention in a military brig, forfeiture of a percentage or all of her pay while in jail and has a guarantee she will not receive an honorable discharge from the military upon completion of her jail time, thereby forfeiting at least some, and likely all, of her benefits. "To me, when we are willing to get an other-than-honorable discharge for the purposes of ending this situation and having some stability for her child, it’s disappointing that he [Major Gallagher] feels it needs to be a criminal charge," Sussman told Truthout, "They are throwing the book at her, even though she’s already been punished a lot. She’s had her child taken away from her, she did three days in jail when she was arrested in November, then three weeks on 24-hour watch sleeping on a cot in the recreation room [at her barracks] after that, and then assigned to post." Currently, Hutchinson remains assigned to Hunter Army Airfield near Savannah, Georgia, where she has been posted since February 2008. In mid-November 2009, Hutchinson was jailed and threatened with a court-martial if she did not agree to deploy to Afghanistan. At the time, her son was placed into a county foster care system. 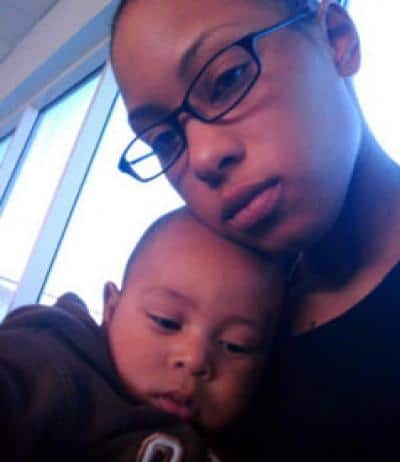 Prior to this, Hutchinson was, according to the family care plan of the US Army, allowed to fly to California and leave her son with her mother, Angelique Hughes of Oakland. However, after a week of caring for the child, Hughes realized she was unable to care for Kamani along with her other duties of caring for a daughter with special-needs, her ailing mother and an ailing sister. In late October, Angelique Hughes told Hutchinson and her commander, Captain Gassant, that she would be unable to care for Kamani after all. The Army then gave Hutchinson an extension of time in order to enable her to find someone else to care for Kamani. Meanwhile, Hughes brought Kamani back to Georgia to be with his mother. Faced with this choice, Specialist Hutchinson chose not to show up for her plane to Afghanistan. The military arrested her and placed her child in the county foster care system. At that time, Sussman told Truthout, "I think they didn’t believe her that she was unable to find someone to care for her infant. They think she’s just trying to get out of her deployment. But she’s just trying to find someone she can trust to take care of her baby. She has never intended to get out of her deployment." Hutchinson’s mother flew to Georgia and took temporary custody of the baby, but was quickly overwhelmed and did not feel able to provide long-term care for the child. At the time, Sussman told Truthout that the Army’s JAG attorney, Capt. Ed Whitford "told me they thought her chain of command thought she was trying to get out of her deployment by using her child as an excuse." Major Gallagher also told Sussman in November that he did not believe it was a real family crisis, and that Hutchinson’s "mother should have been able to take care of the baby." Sussman hopes that they are able to resolve the situation with a good solution for Hutchinson, "where she’s not separated from her child and not given a criminal conviction. So I hope she can either beat the court martial or find a good resolution by working with the Army. But I’m pretty frustrated that they still want to punish her, even though she’s been fully cooperative with them from the very beginning." When Hutchinson returned from her holiday break last week, she brought Kamani with her. According to Sussman, Hutchinson hopes that if she is taken to jail again, she is given notice so that she can make proper arrangements for her son. Sussman is clear about what she feels the Army has done to mishandle the situation: "The whole situation arose in large part because it was a failure of her chain of command to properly counsel her when this began, and now they are still failing to give her compassion and discretion when her child is involved, and they are treating her like there is no child involved and there was no excuse for her not to show up. When in reality, she was forced to choose between her child and her mission, which is obviously a difficult choice."